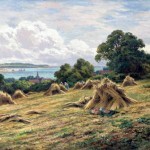 Home » Parker, Henry H.
He is one of the few Victorian-era English painters who never participated in the exhibitions in London. He didn't have to. His work was so popular that he was under contract with several dealers, a practice generally frowned upon which was why he signed his works using multiple variations of his name to avoid discovery. His real name is Henry Hillingford Parker but he also signed his pieces with the names H.D. Hillier, H.D. Hillyer or simply Hillyer. He was born in London in 1858, died in and lived there for most of his life. He studied art at the St. Martins School of Art which had been established on 4 years before his birth. 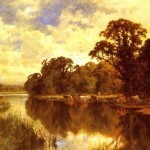 He also studied at one of the Royal Academy schools and many art scholars believe his work was influenced by Benjamin Williams Leader (1831-1923). He worked as an illustrator at the Illustrated London News but for most of his career he worked for private galleries. Perhaps as young as 23, Parker was already known for his beautiful landscape paintings. 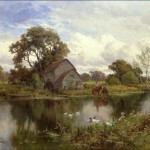 His paintings remain quite popular and typically portray the beauty of the English countryside. A number of his paintings show the growing influence of Impressionism with brighter colors and bold splashes of color replacing fine details. 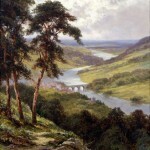 Many of his paintings include the Thames or feature the landscape in and around Kent, Surrey and Wales. Parker's landscapes have a quiet and gentle quality and are considered “pure” landscapes. They are often featured cloudy skies but the overall impression is one of a bright, sunny day.